Medical Laboratory Technician (MLT) student Brandon Birdsell didn’t always know he wanted to pursue a job in the MLT field. An Army veteran, Brandon served several years in the military before deciding to return to school. After speaking to the MLT program director, Brandon found just what he was looking for in the healthcare field. “[I] have never been happier with my decision,” he says of his choice to pursue the MLT program. As a military veteran, Brandon came to ICC with a unique mindset that he says was modified a bit by his return to the classroom. 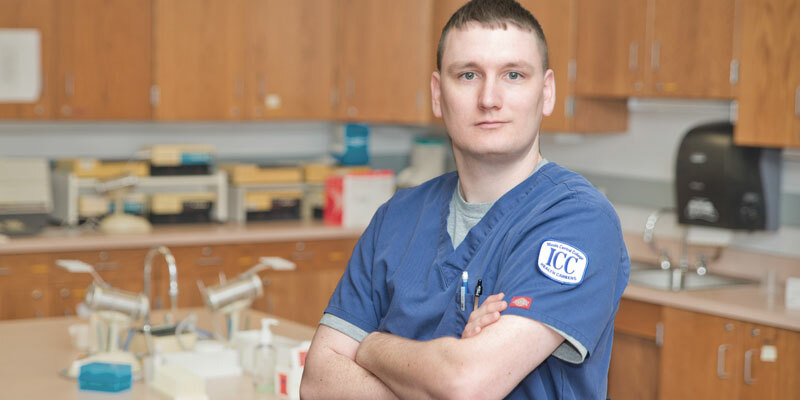 After ICC, Brandon plans to work for a few years before potentially pursuing a four-year bachelor’s degree in the Medical Laboratory Scientist field. For now, Brandon is busy with his studies and the job he has already obtained in the MLT field. A Career and Technical Program at ICC might be the path to your dream job, too. Search our programs for your dream job!